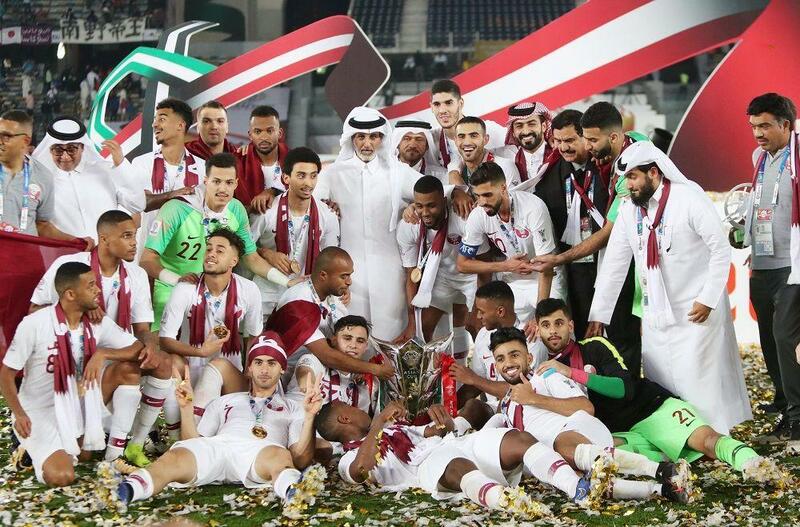 Coming from nowhere to win the Asian Cup is just part of the process for Qatar as they look ahead to this year's Copa America and then the big one -- a home World Cup in 2022. But it is hard to overstate their achievement in going from zero points at the last Asian Cup to their first continental title in record-breaking style. "I'm sorry for breaking Mr. Daei's record," a humble Ali said after scoring his ninth of the tournament. "I expected to score goals -- maybe three or four -- but I didn't expect to score nine," he added. Fittingly for a team that has punched above its weight, Akram Afif struck a boxing-style pose as he celebrated the late penalty that ended Japan's resistance. They also thrived in a hostile environment in the United Arab Emirates owing to the ongoing Gulf blockade, with their fans largely barred from visiting and home spectators pelting them with shoes and bottles in the semi-finals. The title raised the beguiling possibility of Qatar being crowned champions of both Asia and South America, when they compete at the Copa America as guests in June-July. But Ali said the Copa was all about learning for Qatar, continuing the methodical approach which has already paid dividends. "We're not expecting to win, but just to learn because after the World Cup, the Copa America is the biggest competition in the world," Ali said. "The weakest teams are in Asia, Asia is the weakest continent for football so in the Copa America we will learn more. "We'll benefit a lot as a Gulf team -- this will help us have a better performance in 2022." After spending many millions their world-class Aspire Academy, and scouring the world for top coaches, Qatar are beginning to recoup their investment. Head coach Felix Sanchez led Qatar to their first Asian under-19 title in 2014, and they reached the semi-finals at last year's Asian under-23s -- where Ali was also the top-scorer. Afif clocked up a tournament-record 10 assists and formed a devastating partnership with Ali, underlining Qatar's cohesion in both defence and attack after years spent playing together. "We've been together seven years so I know exactly where Akram will be, where he will pass and he always knows what to expect from me," Ali said. "That's normal after all the time we've spent playing together. We get along very well together too." Qatar's win sparked jubilant scenes back home in Doha but for the team, bigger goals now lie ahead. "This is one step more to continue developing the team, to play another tournament in the summer and to be ready in 2022 to represent Qatar in the World Cup," Sanchez said.